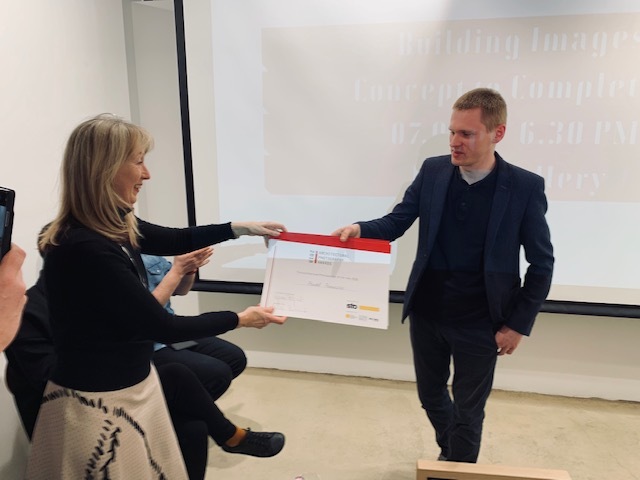 Thursday 7th March 2019: Overall and Portfolio category winner of The Architectural Photography Awards 2018, Pawel Paniczko receives his certificate from APA Director, Lynne Bryant during Sto Werkstatt's Building Images: Concept to Completion event at London's Lever Gallery. 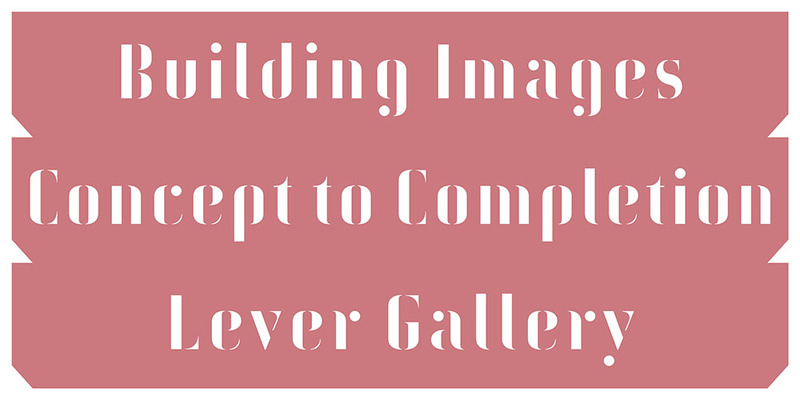 Building Images: Concept to Completion - a panel inspired by themes and work presented in this year's Architectural Photography Awards, presented by Sto Werkstatt. This panel is an opportunity to hear from shortlisted and winning architectural photographers, including winner of The Architectural Photography Awards 2018, Pawel Paniczko, shortlisted architectural photographers Laurian Ghinitoiu (Architectural Photography Awards 2018) and Martine Hamilton Knight (Architectural Photography Awards 2017), each presenting recent works and insights into their developing industry. They will be joined by architects, 3D CGI artists and creative directors on the evolution of architectural image making from concept to completion, and the increasing importance of photographic methods throughout. 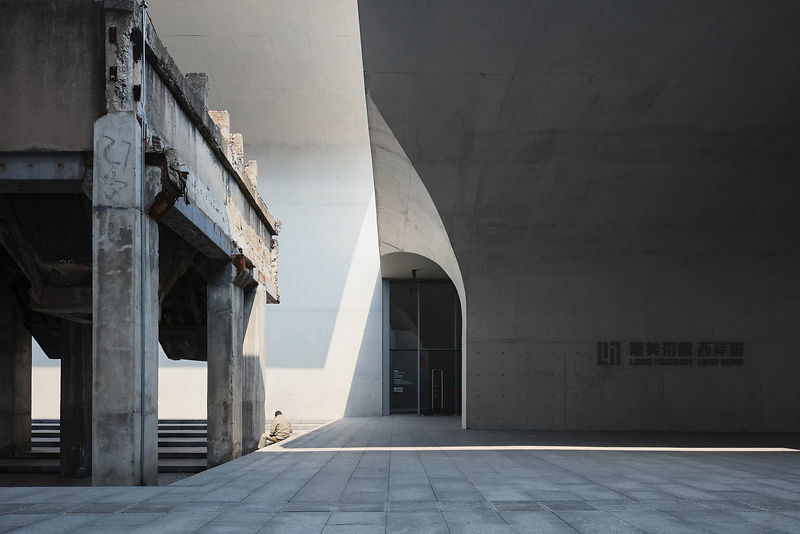 30th November 2018: Pawel Paniczko from Stalybridge in Manchester, UK, with his photo of the Long Museum West Bund, Shanghai, China by Atelier Deshaus, is the overall winner of The Architectural Photography Awards 2018, which is sponsored by Sto and Dornbracht and supported by the World Architecture Festival (WAF) and Picsel. After 2 rounds of judging, over 1200 of entries from the 4 main categories - Exterior, Interior, Sense of Place and Buildings in Use - were whittled down to a shortlist of 20 images and the overall winner was voted for by visitors to WAF. Pawel’s image, which he entered into the Exterior category winning him $3000, was announced as the overall winner at the WAF Gala dinner in Amsterdam on Friday 30th November. Pawel is also the winner of the Portfolio category, a new category added to this year’s competition, as chosen by this year’s panel of judges, winning a $1000 prize with his 6 images of the Harbin Opera House, Harbin, China by MAD Architects. The Mobile category, another new category added this year, has 2 winners, each winning a prize of $250. He Zhenhuan from China with his photo of an overpass in Chongqing, China, which was shot on an Apple iPhone SE, was chosen by our panel of judges, and John Pinder from Carshalton, UK wins the public vote with Half Spiral, an abstract photo of a spiral staircase, which was shot on a Samsung Galaxy S8. Votes were cast via the competition website. Overall and Portfolio winner Pawel Paniczko says: “I love to photograph buildings that create emotions and both Long Museum West Bund and Harbin Opera House were these kinds of structures. Spending a time in and around these buildings, watching how people interact with them and how the light changes in the course of a day, was truly inspirational. That helped me to catch the essence of the buildings presented in my images. Shooting in China on my own was logistically challenging but also a fantastic experience. The Award and certificates were accepted on behalf of the winners by Architectural Photography Awards founder, Lynne Bryant and Ulrike Stotmeister, ambassador of the Stotmeister family, during the WAF Gala dinner. Omer Kanipak, from Turkey, with his image of the Hive at the Royal Botanic Gardens, Kew, UK designed by Wolfgang Buttress is the winner of the Buildings in Use category, Andrew Robertson from the UK with his image of the Ouse Valley viaduct in Sussex, UK designed by David Mocatta is the winner of the Interior category and Marco Tagliarino from Italy with his image of the Piazza Duomo from the Arengario Balconi of the Palazzo dell'Arengario, Museo del 900 in Milan, Italy designed by Italo Rota and Fabio Fornasari is the winner of the Sense of Place category. 1st October 2018: The Architectural Photography Awards 2018, sponsored by Sto, Dornbracht and supported by the World Architecture Festival (WAF) and PICSEL, reveals its 20 shortlisted photographs. The Architectural Photography Awards highlights the expertise of architectural photography and aims to focus on the skill and creativity of the photographer. 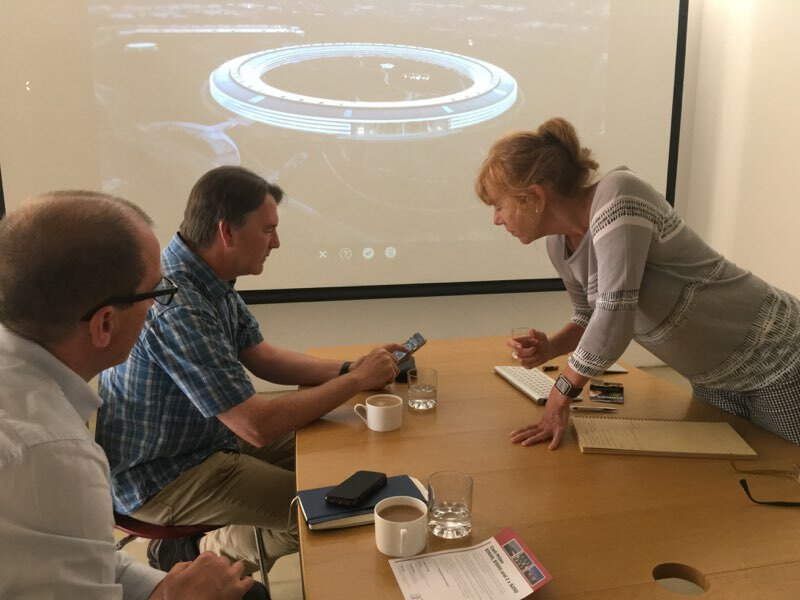 Introducing 2 new categories - Mobile and Portfolio to the original Exterior, Interior, Sense of Place and Buildings in Use categories, has contributed to a record number of budding and professional photographers participating. Entries have been across 47 countries; the top 4 are 28% UK, 20% USA. 6% Germany, 5% China. 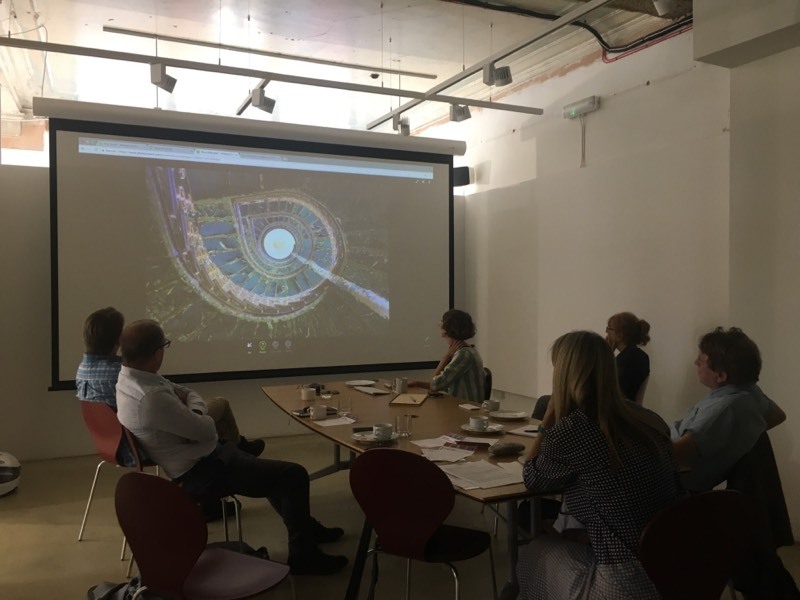 The 20 shortlisted images have been selected by our international panel of judges from the 4 main categories - Exterior, Interior, Sense of Place and Buildings in Use. The 20 photographs will be exhibited at WAF in Amsterdam from 28th-30th November where visitors to the Festival can cast their vote for the overall winner of the 4 main categories. The overall winner will be announced during the WAF Gala Dinner on Friday 30th November along with the winners of the pre-judged Portfolio and Mobile categories.